We are pleased to have our very own 2010 Climbing School Director, and Vice President of two terms, speak to us about another subject dear to his heart.....road biking. 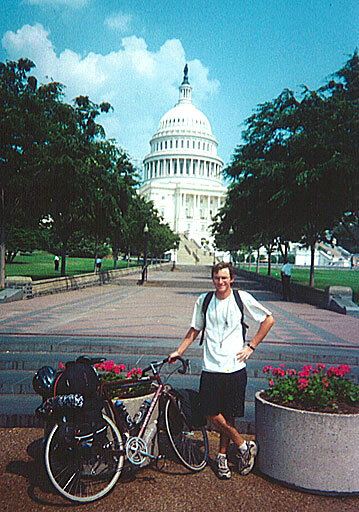 The program will be somewhat commemorative of the 10 year anniversary of Zack's cycle across America in 1999. 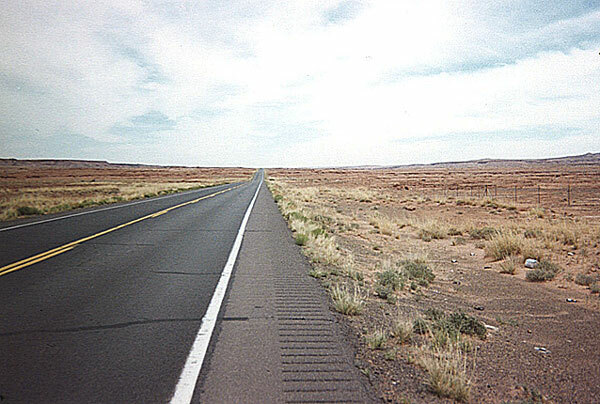 Zack cycled 2,755 miles in 22 days, alone. Zack started in Santa Monica, CA, and stopped in Washington DC. He maintained an average of 125 miles per day, with a peak of 170 miles on two days. He lost about 30lbs, or roughly 1.4 lbs per day. He lost all feeling in both hands by day 14. Zack stares down the long road ahead. Zack spent approximately $150 during the entire trip, sleeping on concrete picnic benches, fields, stranger's homes, and the infield of the ladies' softball field at NAU. Zack avoided mishap except for one spider bite, two encounters with Highway Patrol, 4 flat tires, one car wreck, and a severe case of dysentery. Zack at the symbolic end of his journey. Come to hear his reflections on his trip, including lessons learned. Zack will cover approaches to improve training, decrease the time required, reduce weight loss, and increase comfort. Quick Bio: Zack has been a member of the Los Alamos Mountaineers since 2007, when he took the Climbing School under Jason Halladay. Zack says that he climbs as much as possible, but not nearly enough due to various unfortunate circumstances.....namely work. Mid-PhD, Zack ran with the USC Marathon team and eventually joined the coaching staff. He has run 9 marathons. He obviously enjoys bicycling as well! Having joined the lab, Zack claims to be getting slower quickly.